Lovely scalloped ornate bowls with the geisha girl pattern. 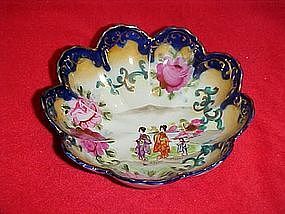 The bowls have a scene of three geishas with large pink roses, cobalt blue trim and lots of gold accents. Bowls measure 5 1/2" in diameter and are 1 3/4" deep. No chips or cracks. Price is for each.